We’ve been over this. Time and time again. The New York movement is upon us. Some of them work, some of them don’t. So, I read a great deal about the opening of Jackson + Rye and wanting to wait until the soft launch had passed and all the Christmas cheer, I held off. It is marketed as a New York brunch establishment. Of course most, if not all, New York brunch restaurants are open for breakfast, lunch and dinner also. This is no exception. But what it really stands for is the brunch. Much like Mogador, Extra Virgin & Cornelia, to name but a few in Manhattan, its strengths lie in that delightful time between breakfast and lunch. 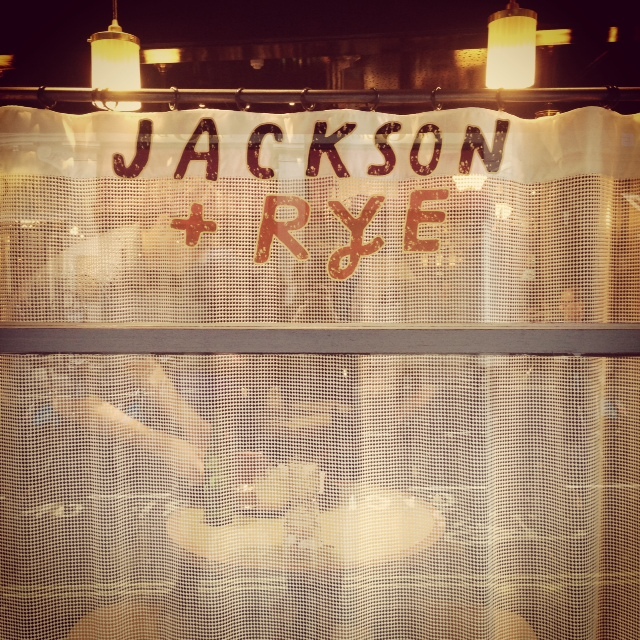 In prime position on Wardour Street just passed Old Compton, lies the very thoughtfully designed Jackson + Rye. It looks like an East Village brunch spot, slow-moving ceiling fans and everything. We were greeted immediately and seated by the window. The place was packed, this being the first Sunday of the new year, I was quite surprised. Having mentioned ‘The Nudge’ when the reservation was made, both me and my guest were given a free cocktail of our choice. You can use this offer until the end of January, as a heads up! I chose the Breakfast Sour – Buffalo Trace, lemon, egg white, apricot preserve, peach bitters. 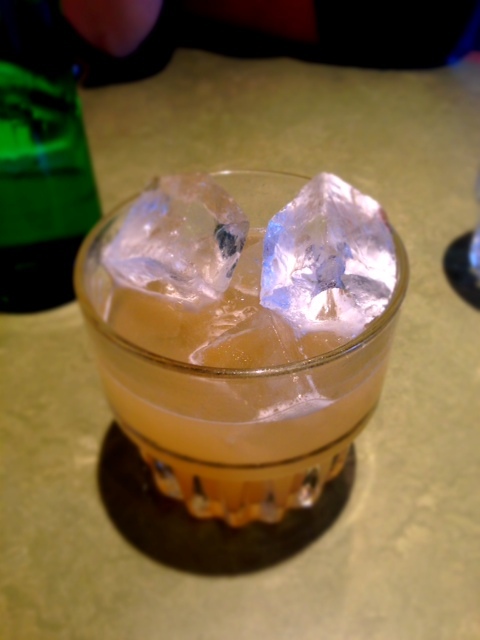 It arrived adorned with giant ice cubes in a no fuss, short tumbler. It was an interesting taste, a heavy tone of whiskey and a sharp bitterness to it. The whiskey hue smoothed this, but all in all it was too strong for me. Perhaps it’s old-fashioned of me, but cocktails that can be had with the first meal of the day shouldn’t be the same as the one you would choose last thing at night. We chose a dish each and one to share. There was just such an abundance of choice, we didn’t want to miss out. 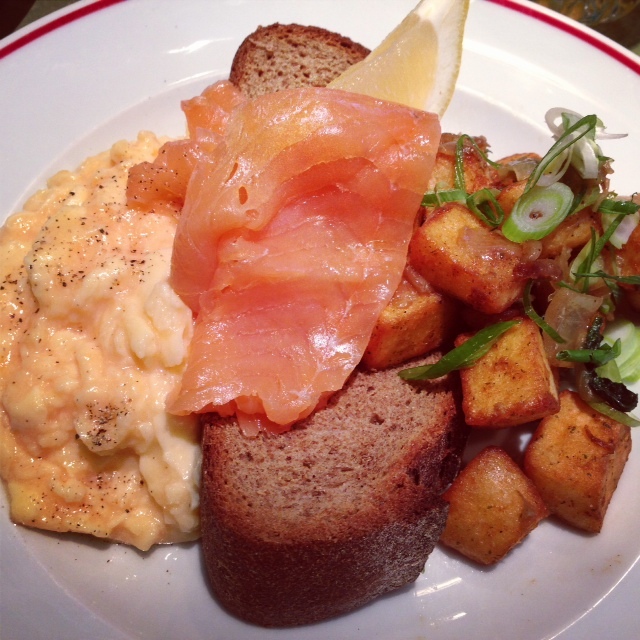 I went for the ‘Anglers’ (scrambled eggs, smoked salmon, country-style potatoes, grilled toast). 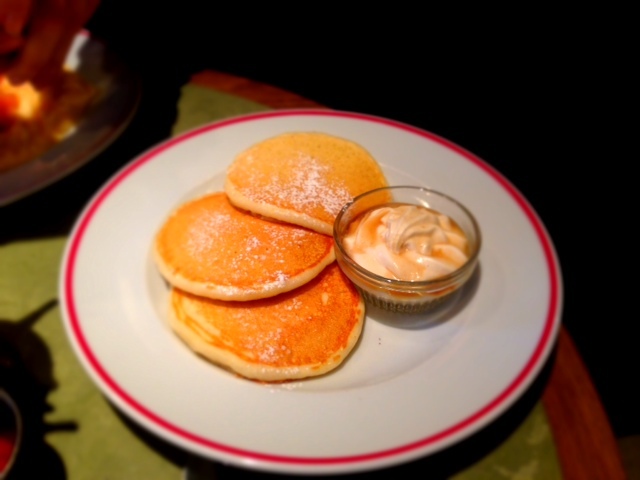 The scrambled eggs were cooked to perfection with a creamy texture involving the yolk not quite hardened. Heavenly. The salmon was of very good quality and thinly sliced. The potatoes looked a little dry, but upon sampling them, they were nothing of the sort. They were seasoned excellently and combined with caramelised onions, a sprinkling of spring onions and a fluffy interior, they really completed the dish. It was not served with grilled toast as mentioned, but thick sliced rye bread. I tried this, but the potatoes gave me the carb infusion needed, so I didn’t feel the bread was really vital to the dish. All in all this was a perfect blend for brunch. 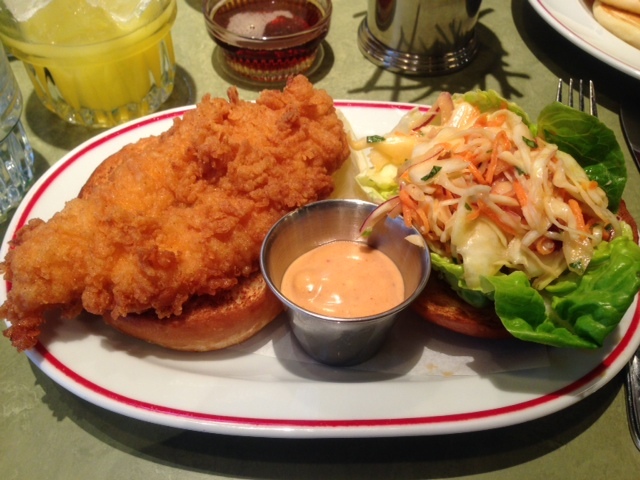 Next up was the Buttermilk Fried Chicken Sandwich. This says it comes with avocado and chipotle mayonnaise. The latter is true but there was no avocado in this burger, but a slaw instead. Served on a soft brioche bun it came open, I presume so you could add the chipotle mayo freely. The chicken was unbelievable! I know that must sound like an abrupt statement, but the slight crunch of the batter was bliss, followed by, quite possibly, the softest chicken I’ve had since visiting New Orleans. And let me tell you, it’s pretty daring to mention the deep south when talking about fried chicken. 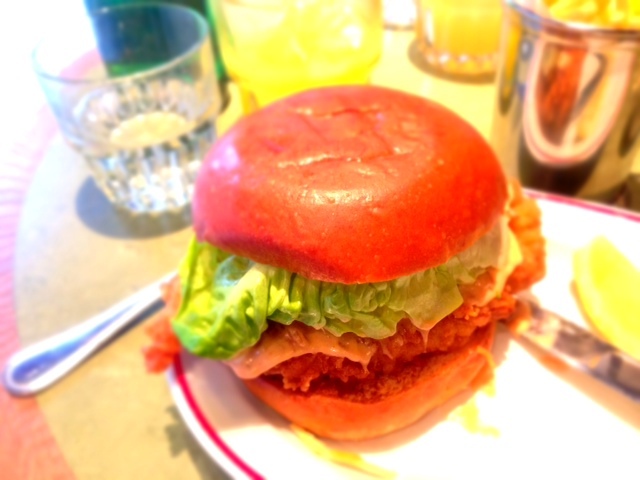 The brioche was a great choice and always a favourite when it comes to a chicken burger, it sweetens the dish and the softness of the bread works well when moulding around the awkward shape of the chicken. The slaw counterbalanced the brioche as it gave a splash of savoury to the burger. The chipotle added some spice and the end result was a pretty perfect burger. I had been hearing a bubbling on the foodie scene with talk of Boopshi’s on the horizon. The appeal was definitely hitting home for me. In more ways than one. 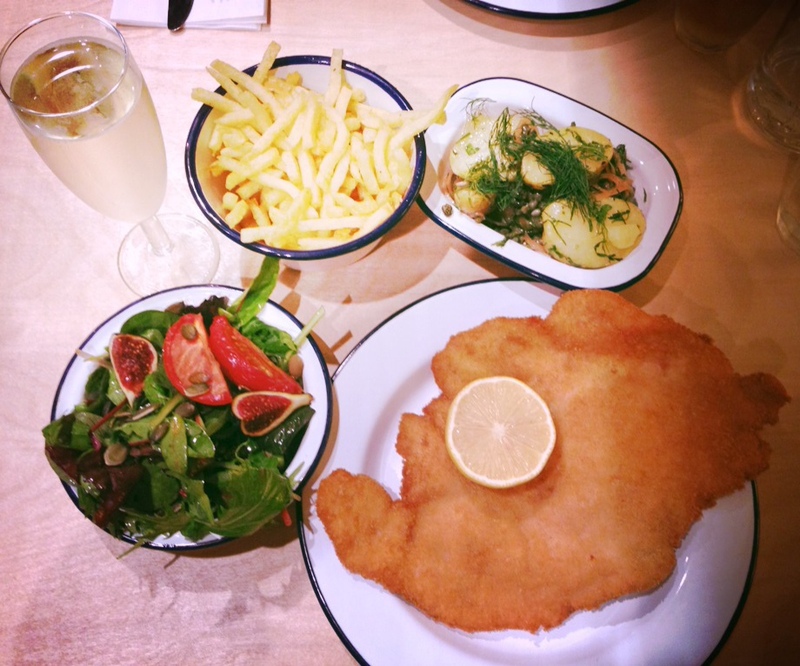 The main features are schnitzel & spritz. At first I thought it was more of a gimmick, like with bubbledogs (to which I wasn’t a fan) but delving deeper I learnt it was so much more. 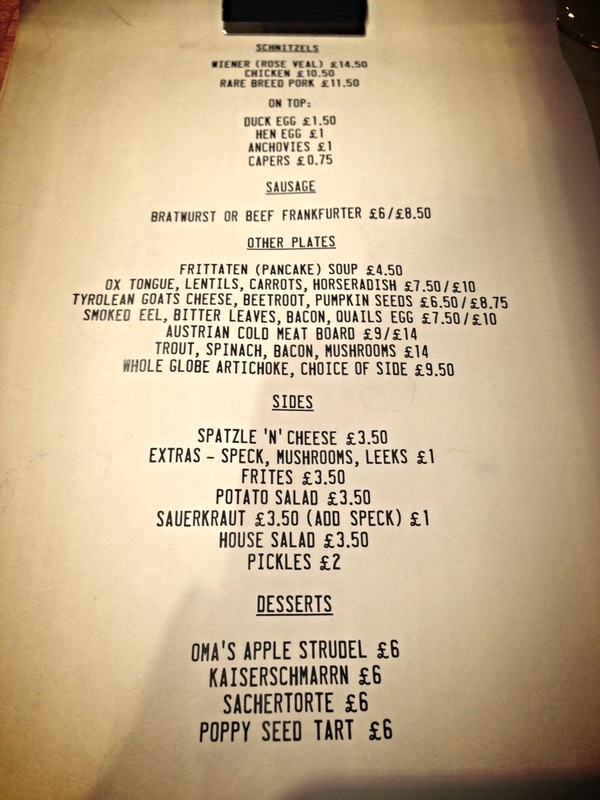 It’s Austrian fare and not only have they taken the very best it has to offer, but they have honed the recipes exceptionally. I’m half Austrian and with a Viennese mother I grew up eating schnitzel, potato salad, poppy-seed cake and the like. It was standard for me, like roasts for true Brits. My sister’s wedding cake was Sachertorte, from Hotel Sacher, in a plethora of sizes and so I feel whilst I am suitably familiar with Austrian food, I also have very high standards. Aky came with me and although he has tried all of these things, he hasn’t grown up on it and so it was interesting to have a view on the food from someone who is, let’s say, unbiased. 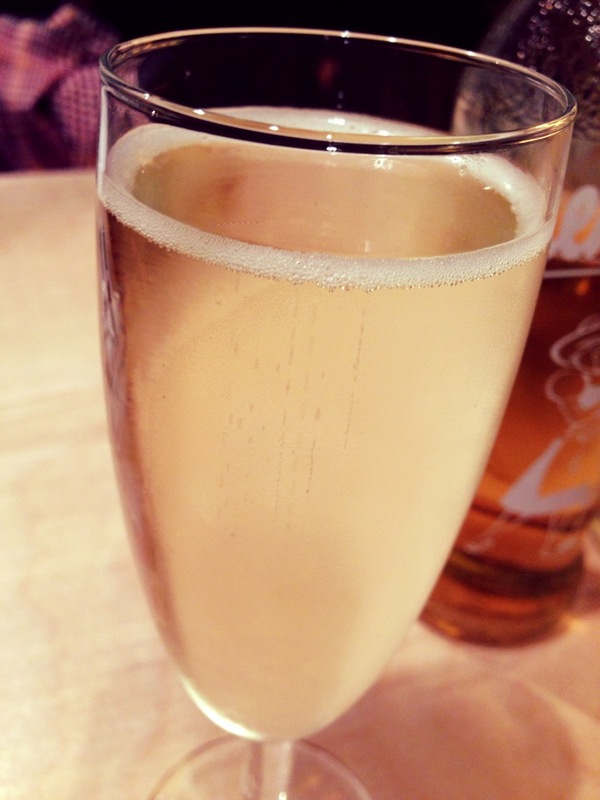 To drink, I had a glass of their Prosecco (on tap) Terra Serana Doc, 150ml. It was a little dry for me, but never the less a bit of fizz to start the night always makes it feel a little more special. 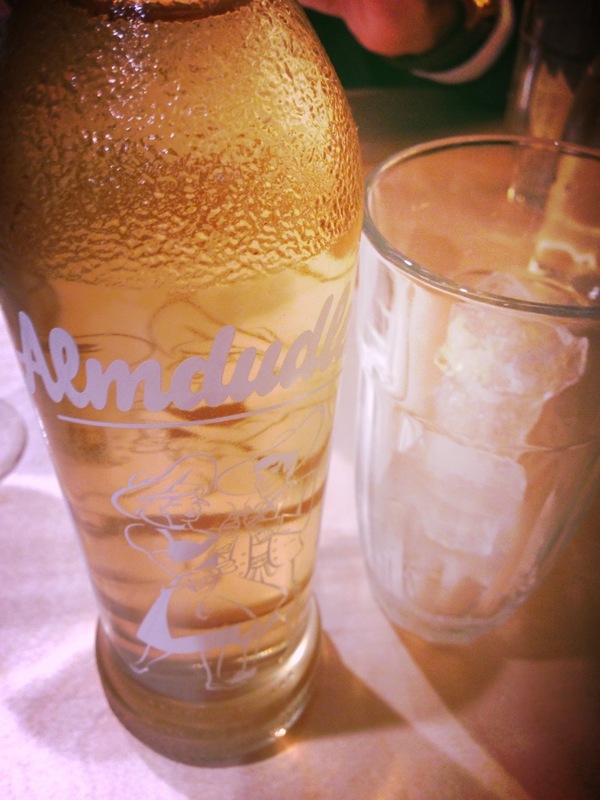 We also ordered an Almdudler. This is a soft drink made from mountain herbs. I can only describe it as a bit like ginger ale and lemonade, but actually unique in its own way. It was my mum’s go to soft drink as a kid and seeing it on the menu makes me laugh as I remember her and my aunt singing the jingle from the advert like they’re school children. It never fails to make me smile. We looked over the menu and decided to go with what it said on the tin. 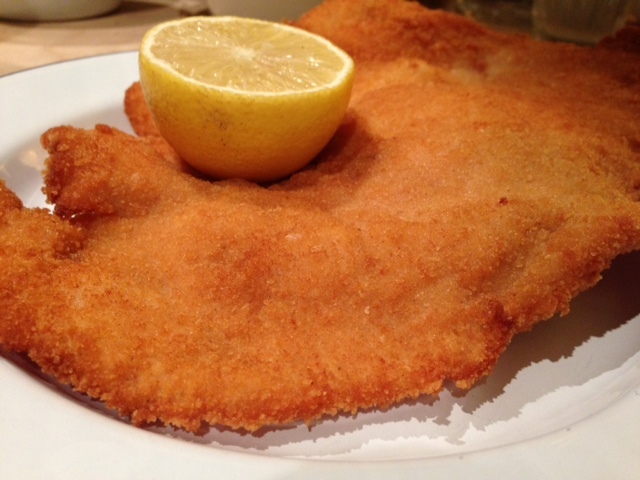 Schnitzel. We both chose the chicken. 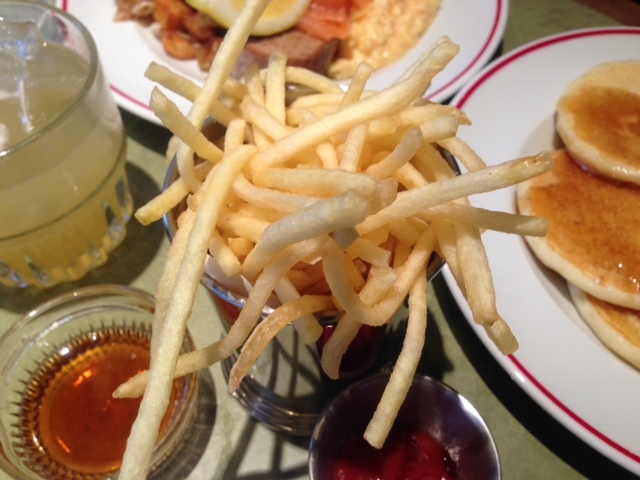 And to accompany this we went for potato salad, frites & house salad. There’s quite a lot to choose from, but they’ve broken it down in a really simple way. The chicken arrived and just like in Austria, it was flattened out and was the size of a pancake, it looked incredible. Golden and thin, with a big wedge of lemon on top. I couldn’t wait to get stuck in and it didn’t disappoint. It had enough salt and the chicken was soft. The bread crumb coating covered the chicken well, with nothing falling apart. It was very authentic. I have to say my Mum’s is better…but that’s a good thing. Aky thought it was divine, which it was. The squeeze of lemon gave it just the burst it needed too. The potato salad was interesting, not what I’m accustomed to. 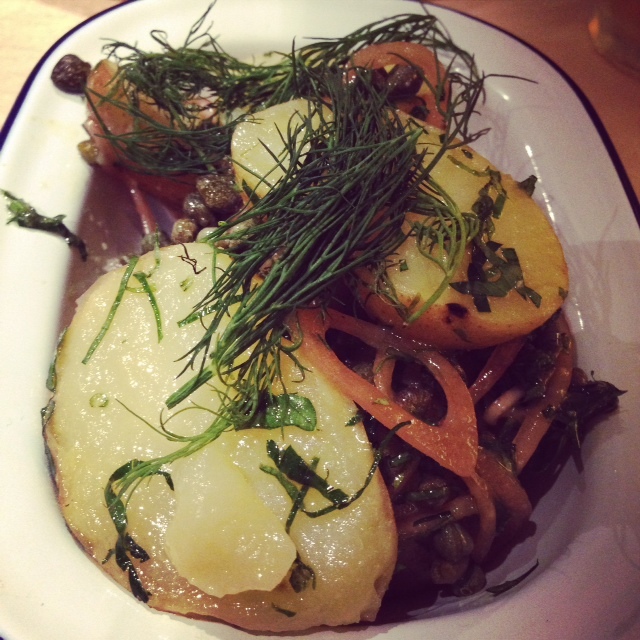 It was combined with pickled sliced onion, capers and dill, dressed lightly. I really enjoyed it, it was sweet, but with a hint of the sour from the onions. My only criticism would be to peel and slice the potatoes as my Mutti would have done. It then absorbs more of the dressing that way and is easier to eat. 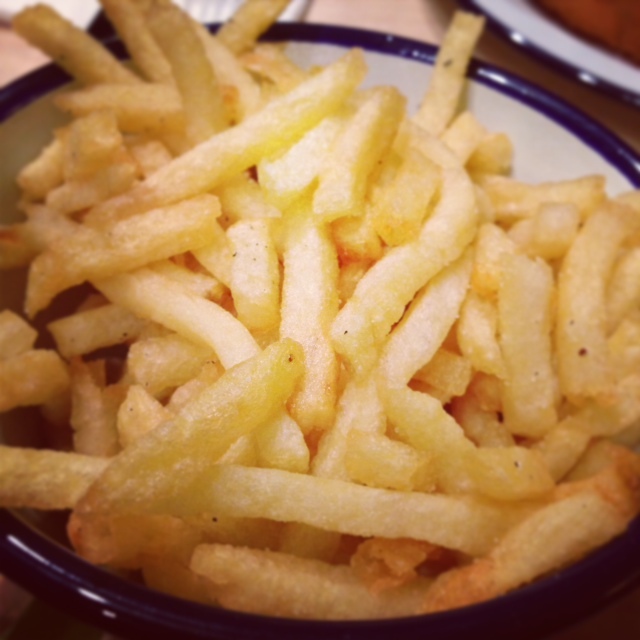 The fries were incredible, soft with a little bit of crisp and had just the right amount of oil and seasoning. Unbelievably addictive and appealing. Who doesn’t love chicken and chips? The house salad was a real corker. 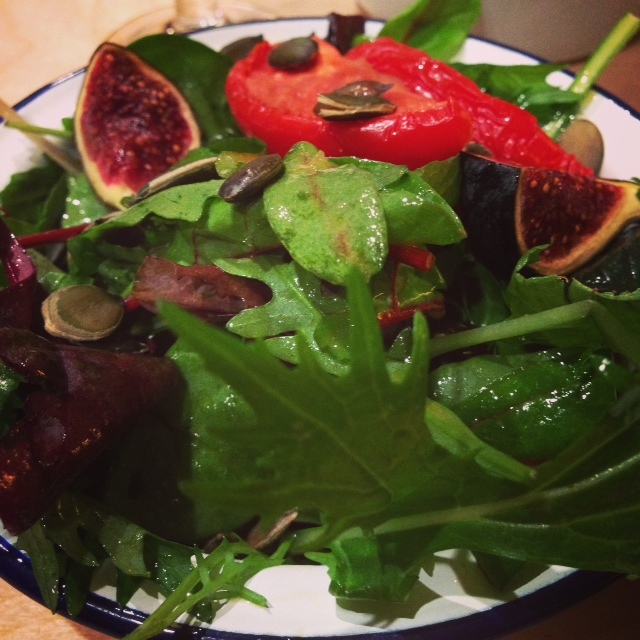 Mixed leaves with sunblush tomatoes, sliced fig and pumpkin seed in a raspberry dressing. It’s making my mouth water just writing about it. It was refreshing and sweet, but not too much and oh so colourful! A light addition to an otherwise carb-fuelled meal. The dishes all combined were just fantastic. There is a use of flavours more bold than most and the heartfelt authenticity is really apparent on the whole. Whilst I know my opinion is biased, I do realise just how good this place is. They’ve gone for a minimalistic feel with the decor, but it makes it less stuffy and more inviting to know that simplicity was all they needed, because the food is the true focus. I took a brief trip downstairs and the arrangement of the seating is fantastic, like a proper hideaway, a great place for cocktails and a few plates. The bathrooms are like an underground cave, with low curved ceilings…one pointer, they need a mirror in the ladies! We chose to share a dessert and let me tell you, it was pretty damn hard narrowing it down to just one. 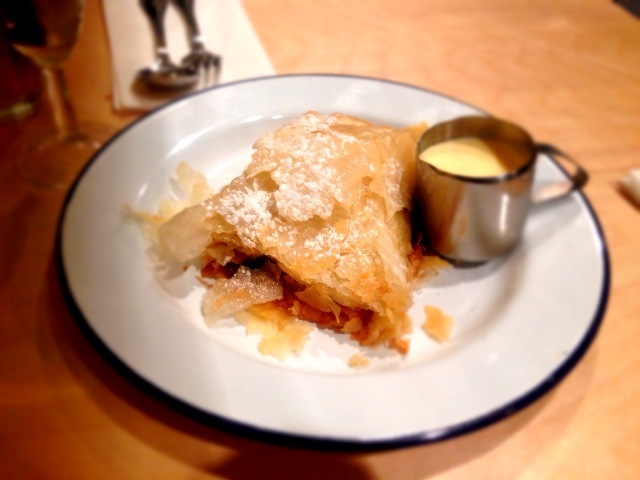 We ended up going with Oma’s Apple Strudel. If the boys are naming it after their own Grandmother’s, then this had to be the real deal. This was quite possibly the best dessert I’ve had in London. The filo was wafer thin, the seasoning acutely perfect and the apple sweet, but with just the right amount of tartness. It was epic. Absolutely out of this world. I’ll be bringing my mother and I know it will cause nostalgia. I really loved it, and you all know I don’t give comments like that lightly. I think there’s room for a little improvement, but these boys have done their family proud. I’ll be back to sample the wurst as the aroma coming from the diners next to us was almost too much. I’d love to see creamed spinach added to the menu…in which case a mirror will most definitely be needed in the bathrooms!